In 2007, after the launch of the World House Project, the IwB set out to test the World House Matrix tool it had developed through a demonstration project. The Matrix identified 12 systems that that are needed in every home regardless of location and culture: water, food, waste, construction, air handling, energy, finance, mobility, communication, as well as social, spatial and identity. These systems combined to address the home’s relationship to climate, terrain, economy, and culture and could be manipulated to make houses more sustainable, intelligent, inclusive and healthy. The Living Model Version 1 was designed and built by the IwB students and faculty as an exhibit and a prototype of the IwB’s methods and principles in a 72-hour period in anticipation of a week long series of events that culminated in the first year of the World House Project, kicking off the next three years of research. A mockup was erected at George Brown College and later, a full version was completed in the garden of the Berkeley Church in Toronto. 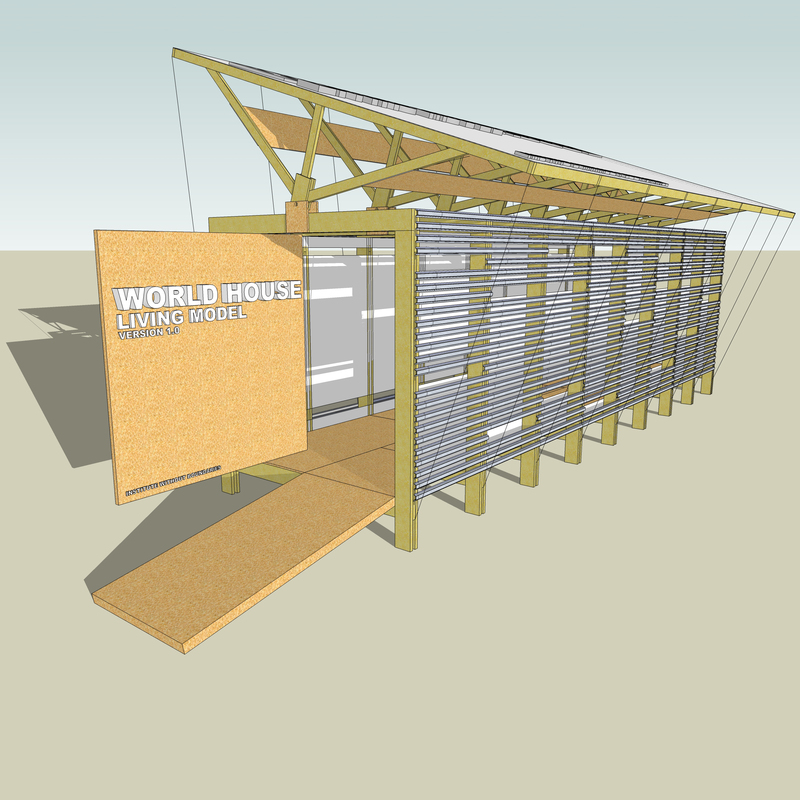 To design a prototype house that would test the World House Matrix tool created by the IwB for the World House Project. To reevaluate contemporary residential building practices and propose innovative and accessible housing solutions for the future by altering the relationship between the users, the home, and the surrounding spatial environment. By building the sketch you learn what’s actually working and what’s not. One of the main tasks of the first year of the World House Project was to develop a design and construction plan for a house the would encapsulate the values and methods of the World House Project. World House confronted the evolution of shelter for coming generations by developing housing systems based on principles of sustainability, accessibility, technological responsiveness, and ecological balance. It stressed the contemporary need to reevaluate what is a home? And asked critically how do we want to live? The Living Model was a sketch or cartoon of a World house. It was an exhibition and ‘symbolic environment’ that demonstrated the elements central to the World House Project. The IwB students researched case studies of how to best integrate the 12 systems identified in the World House Matrix tool in the house and worked with the IwB’s construction partners to build the Living Model. 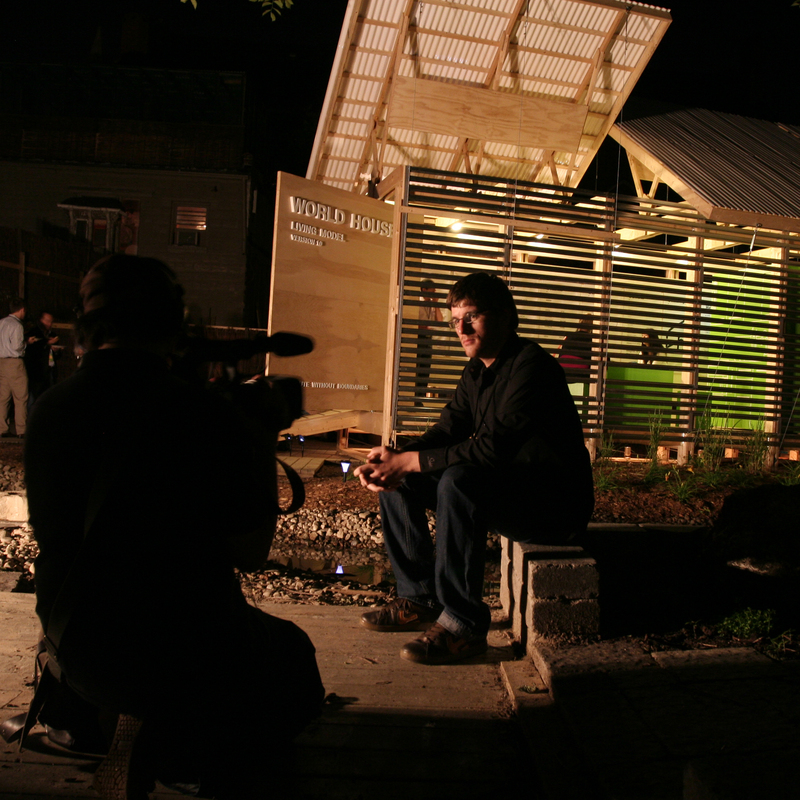 The house design was modular in construction, adaptable by its occupants, mobile, and sustainable, featuring new green building technologies like its movable solar tilting roof. It was also based on standard units of construction materials to minimize waste and to promote recycling. The Living Model stressed direct communication between the user and the environment, in particular universal adaptability; the roof, faucets, beds, etc. were all designed for universal adaptability. Even the facade was flexible, the materials could change based on climate needs and user preferences. The housing system allowed the home to be generative grouping and shrinking over time as needed. Reevaluating the communication between the user and environment also meant paying close attention to the relationship between private and public spaces in and around the home. Internally, this meant looking at the relation between general spaces and services of the house and placing primacy on the efficiency of services. For instance, all of the things requiring water and sanitary systems in the house were grouped in one area to maximize efficiency. The dining room and the bedroom surrounded a service core. This allowed for an interplay between ‘wet’ and ‘dry’ zones in the planning of the home. In addition, the house adopted the concepts of the ‘superframe’ and ‘inframe’ which had been developed throughout the year. The superframe was a pre-manufactured over all structured system that was mobile, quickly, erected and prefabricated while the inframe was an open source set of adaptive devices that could be interchanged making up the skin, furnishings, and appliances of the home. Finding these new connections between user, home, and natural environment was what made the Living Model unique. 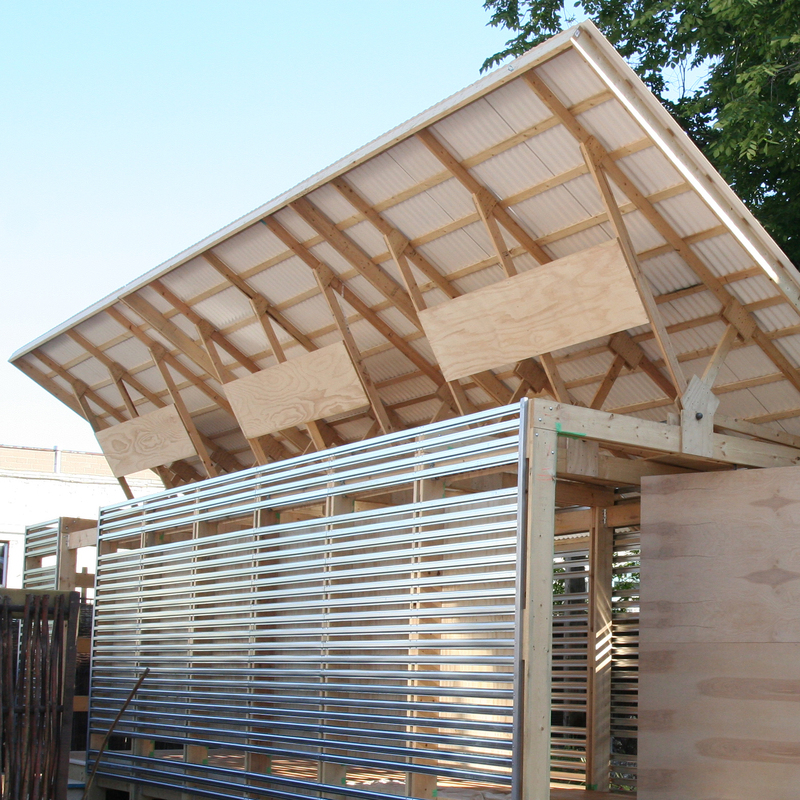 This first version kicked off the Institute’s continuous project of re-evaluating and generating systems for shelter that would result in the award winning Canühome prototype amongst others. The Living Model proved that collaborative creation could quickly generate a system approach to housing. Most importantly, it made concrete the philosophy of the IwB to test its methods and principles by taking them into reality. The reiteration of the World House principles through the Living Model v.1 put to test the Institute’s ideas and showed the necessity of continuous prototyping by the Institute. Thus, the Living Model set the tone for future home prototyping by the Institute, principally, Canühome (v.2), the World House Costa Rica (v.3), and the Sharon Temple Pavilion (v.4). Today the Living Model is located at the Berkeley Church, where it has been converted into a wedding pavilion and while it has suffered the vagaries of weathering if has lived up to its goals having been relocated on site three times.